Happy Badgers made a journey once again to the super fun Indy Pop Con 2016 and holy hovercrafts was it fun. There were so many amazing games, so many amazing people and developers, and lots of cough drops. We gave you guys a “Guide to Indy Pop Con” last year, so we won’t go over do’s and don’ts, but we’ll fill you in on all the awesome HappyBadger @IndyPopCon news and happenings. Lot’s of people recognized us from last year, and even commented on the increase in polish of SmuggleCraft! It felt really good to hear our audience talk about how much the game’s improved, especially since we faced a mini-crunch time to get an Indy Pop Con build ready (wasn’t finished until 11am Thursday, we left for Indiana at 11:30. Heart-pounding stuff). Someone actually asked if they could buy our couch. Our personal new favorite was Tot’s Life by johngroot, an indie dev team from Chicago. Seriously, we could NOT STOP LAUGHING the whole time we were playing. Download and play it and pee your pants laughing (https://johngroot.itch.io/tots-life-0). One of the fun things about Indy Pop Con is meeting youtubers and streamers. 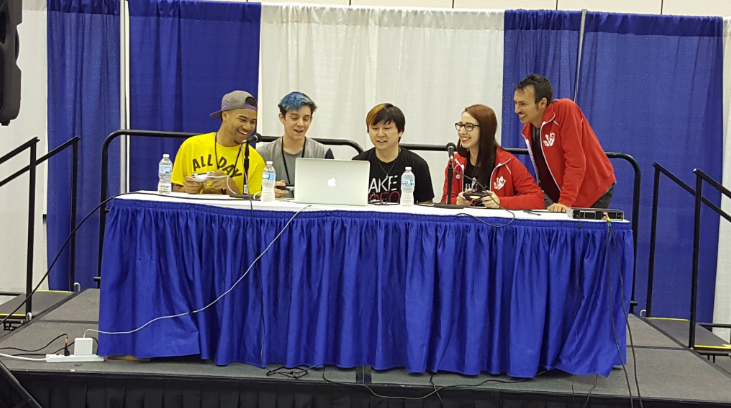 Youtubers and streamers from all over come to meet up, talk to fans, and play new games. We had Let’s Play stage time at 11am on Saturday. 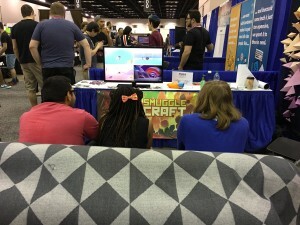 There were plenty of other slots filled with really amazing games, but SmuggleCraft drew the biggest crowd hands down. How you ask (other than being an epic game)? Well here’s our secret…ready? We talk to people O.O. Thursday night, the Badgers made their way to this epic joint Scottys (for some reason this is a key con hangout. take note). There, we were able to connect and talk with a ton of other devs and content creators! We got to meet up with @CrankGameplays who we met last year, and were introduced to a bunch of new friends too. We invited Crank to come on stage with us for our Let’s Play, and quite graciously, he accepted, and brought friends. When the moment of the Let’s Play came, we already had an audience. And boy was the Let’s Play awesome. 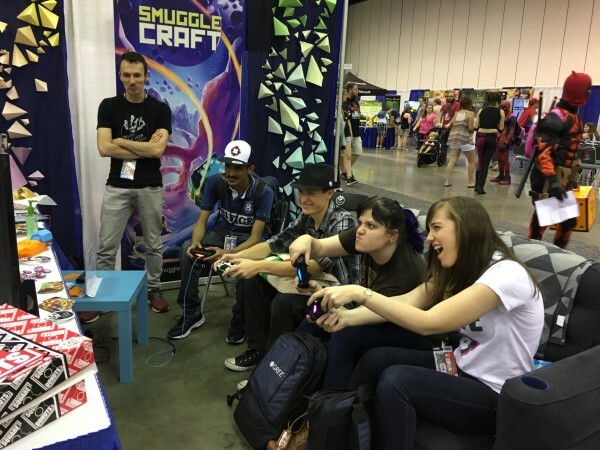 Huge shoutouts to Crank Gameplays @crankgameplays, @OGchanYT, and @girbeagly for playing SmuggleCraft at our Let’s Play! We had a blast playing with you folks! And we can’t forget, BIG congrats to Graphite Labs and their game Hive Jump for winning the Reboot Indie Game Award! STL REPRESENT!!! 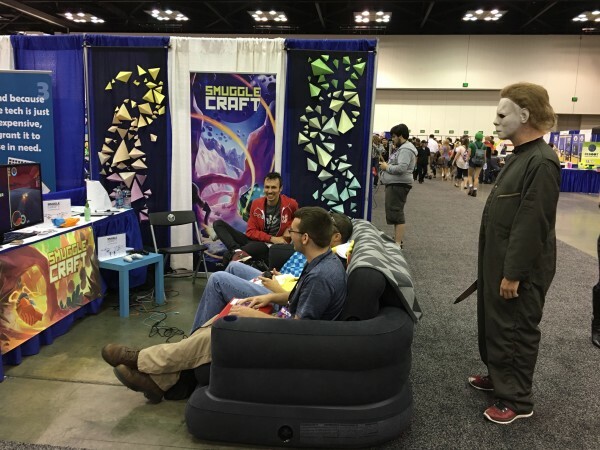 Even Micheal Myers took a liking to SmuggleCraft!..he didn’t say much, but you could definitely see it in his eyes.